This year, we ran a #MuslimsCollab campaign to not only manage sponsorships effectively but also to encourage different Muslim businesses to collaborate with each other and rise by lifting each other up. We love connecting the brands/bloggers together. Comment what are you grateful for on Instagram videos. Highlight a unique side of gratitude – something that few people think of when they talk about being grateful – or something that few people associate with Allah (thanking Him) when they are happy or feel blessed. Instead of saying “Alhamdulillah for everything” – think of something specific (look at THIS FACEBOOK ALBUM from the previous contest for the ideas). 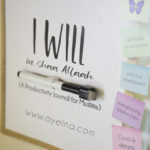 Even if you don’t win, you’ll still be spreading positivity by sharing what gratitude means to you 💜 Joy is toxic and one line from you can make someone feel blessed in their life as well in shaa Allah 🙂 You can follow Ayeina and the collaborators to stay updated with the contest and prize shipping etc. (optional – this won’t affect your chances of winning). The contest is not endorsed by IG. 1) simply comment below the 2 IG posts from 15th March – 17th March. 2) Do not DM (Direct Message) your entry – it won’t be accepted. 3) Please make sure to complete all 3 steps otherwise your entry may get lost in other comments. Each package has two categories – One will be given to the caption most voted by the judges (judgment will be based on originality and creativity). Another will be given to the caption most voted by the community – the voting will take place on the website in shaa Allah (see the schedule below). Vertue Box will be sending one of the winners an original halal beauty box worth over £60. 1) Halal essential oil (Habbatus Sauda – pure and cold pressed oil) from Viva Queen Bee. 2) Rhinestone sparkly hijab pin from Azyaan Online. 3) A dua journal from TheDuaJournal. 1) 15 Dhikr Magnets by Little Muslims Gift Factory. 2) #AlhamdulillahForSeries Gratitude Journal (also sent by Little Muslims Gift Factory). 3) “Do what you love” Notebook by Quote Lovin’. 1) Baby kandoora-romper by Little Muslimah. 2) Online Childbirth Classes by Jeddah Mothering. 3) Choice of Product from Maya’s Organic World. Received my prize from @mayas_organic_world who was one of the sponsors for the #gratitudecaptioncontest by @ayeina_official. Alhamdulillah, jazakAllahu khair sisters, I really hope it benefits my parents in Shaa Allah. The packaging was on point! Comment what are you grateful for on two FACEBOOK video posts. Highlight a unique side of gratitude – something that few people think of when they talk about being grateful – or something that few people associate with Allah (thanking Him) when they are happy or feel blessed. Instead of saying “Alhamdulillah for everything” – think of something specific (look at THIS FACEBOOK ALBUM from the previous contest for the ideas). Even if you don’t win, you’ll still be spreading positivity by sharing what gratitude means to you. Joy is toxic and one line from you can make someone feel blessed in their life as well in shaa Allah 🙂 You can like/follow Ayeina and the collaborators to stay updated with the contest and prize shipping etc. (optional – this won’t affect your chances of winning). The contest is not endorsed by FB. 1) simply comment below the two FB video posts from 26th March – 28th March. 2) Please make sure to complete all 3 steps mentioned above – otherwise, your entry may get lost in other comments. 1) Halal Facial Kit (Turmeric Yogurt facial Soap, Rose Water Facial mist with aloe Vera juice, Hydrating Orange Blossom Cream, and Moroccan Clay Facial Mask Bar) by Zaytoon Naturals. 2) 1-month free access to the Healthy Habits Community by Nutrition by Nazima. 1) Prophetic medicine pack (Zamzam water, organic olive oil, Indian costus, pure sidr leaf powder) & eBook by SunnaHealing. 2) Potluck planner celebrating food from the Quran by Healthy Muslimah. 1) Cookie cutter set by WithaSpin. 2) 2 (Allah and Muhammad) frames by Siraj Store. 1) Wooden Jannah keyring and plaque by Zed&Q. 2) Handmade Bismillah cloth banner by Handmade Beginnings. 3) Arabic Art Print by Little Bulbul. 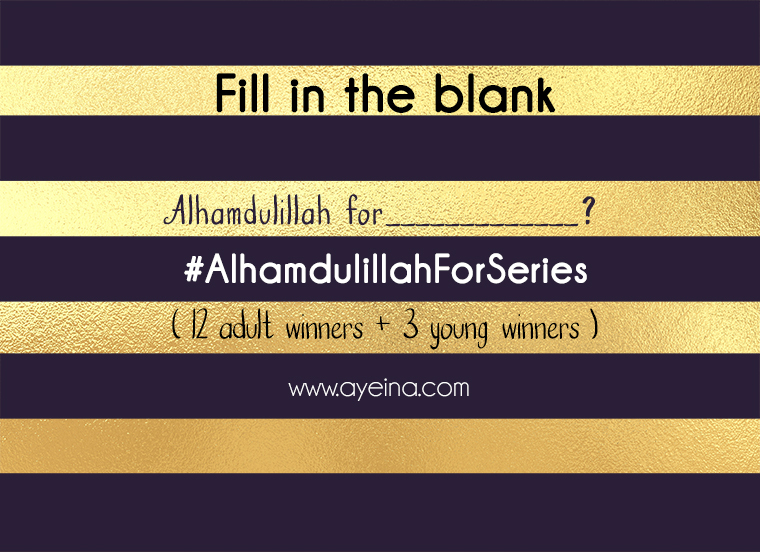 1) #AlhamdulillahForSeries Gratitude Journal from Anafiya Gifts. 2) Choice of Plush Doll by Little Maysoor. 1) “Zaynab & Zakariya (Learn to Recycle)” board book + “Your Surahs made easy” softcover book from Mini Muslim Playground. 2) 1 handmade plush cushion doll – American boy doll named Zakariya by Mini Muslimah. 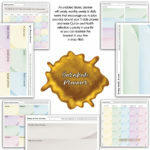 3) Arabic printable packets by Gambian Mommy. Basically, all these amazing businesses came together to give you some eidi and spread positive vibes alhamdulillah. Prize shipping will be free of cost no matter where you are in the world. ▪Open for 13 years and above only (those who have access to social media). For children under 13, the contest will start once the Facebook campaign ends in shaa Allah. Entries will be accepted through the website. Subscribe to Ayeina for updates. ▪You can enter as many captions as you wish as long as they are in a different comment each time (One person cannot win more than one prize bundle). ▪Please do not submit obscene and racially, religiously or sexually offensive captions (You can check our Facebook album to get a better idea of how we ‘caption it’). 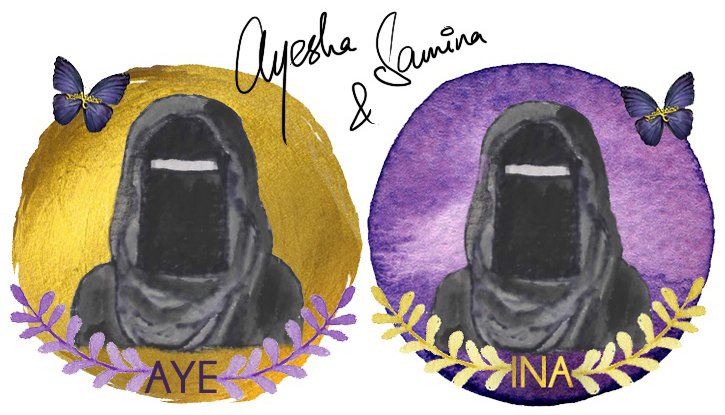 ▪These entries may be used in Ayeina’s social media with credit given to the original entrant. They might also be used in #AlhamdulillahForSeries future books. Sorry, we had to take a tiny break from the gratitude caption contest because of death…BUT what better way to return than restarting the #gratitudeCAPTIONcontest – which was a BIG help in being optimistic and I’m sure it was a confetti of positive vibes for you too! The winners of “gratitude caption contest for adults” were announced a month ago (as you can see on the next page), this time around it’s all about kids! Tell us what are you grateful for? 1) 7 Arabic alphabets board books from Homely Hammock. 1) Beautiful prayer gown and mat from Salaty. 1) Islamic children magazine from My Deen Magazine. 2) Halal multivitamin gummy bears for children from Salaam Nutritionals. 3) 3 personalised headband/clips from Laya and Liya’s Bows. Basically, all these amazing businesses came together to give you some eidi 😀 and spread positive vibes alhamdulillah. Prize shipping will be free of cost no matter where you are in the world. The participating contestants agree to subscribe to Ayeina. First and foremost, ALL of the entries won the hearts. Choosing the winners and offering them something tangible is simply a way to encourage more gratitude among children (although, I must say, they have much more positivity than all of us adults combined) and to put a smile on their parents’ faces as they ask them this question and hear their adorable answers. Jazakumullah khair to the sponsors who picked out the winners and YOU guys who helped us pick out the Honorable mentions through social media comments etc. Every year, we have a set number of winners decided but we end up giving more prizes than the number initially agreed upon. Because you know…it’s HARD ok! Special thanks to Salaty and My Deen Magazine for not only offering a prize package to the winner but also to the Honorable Mentions. ArabicSeeds will also be offering her digital Arabic resources to some of the finalists. Hence most of those who participated went away with one thing or the other. Tangible or digital. 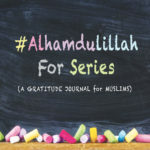 We ourselves are giving our # Alhamdulillah For Series Gratitude Journals to two children in the honorable-mention section. Two of the children (a 4 year old girl and a 9 year old boy) who ended up winning the #gratitudeCAPTIONcontest were those who had multiple great entries mashaaAllah. The girl won Homely Hammock’s board books based on her multiple captions chosen by multiple judges! Alhamdulillah for I didn’t fall after jumping high because I said bismillah before it. Alhamdulillah for Allah gave Jafar at tayyar r.a wings for losing his arms for Allah. (she knew the story of Jaafar r.a. who lost his arms in a battle of Mu’tah and created a caption out of that story – if you don’t know, then this hadith would help: “Messenger of Allah (ﷺ) said: “I saw Ja’far flying in Paradise with the angels.” [Tirmidhi] – hence he was given the title of at-tayyaar). Alhamdulillah for park visits after the mosque visits with my baba. Alhamdulillah for glasses that allow me to see Allah’s beautiful world. Alhamdulillah for good memory to help me memorise the Qur’an. Alhamdulillah for a mom who helps me learn cooking so I can cook when I get older. Alhamdulillah for being able to recite “laa ilaaha illallah muhammadur rasulullah” every night before bed. He won Salaty and Deen Square prize package – sponsors who chose the winning captions, gave their prizes to that kid. He was one of the youngest participants mashaaAllah. 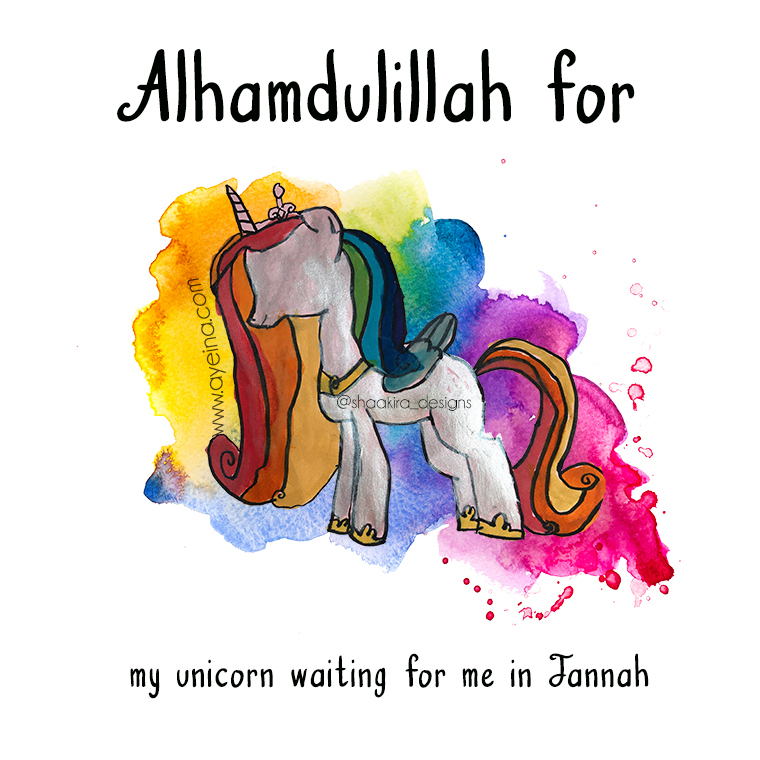 4) Alhamdulillah for my unicorn waiting for me in Jannah. Can you believe this 8 year old girl also sent the art along with her caption (which we converted into a #AlhamdulillahForSeries poster – as shown below). This one has to have the people’s choice awards. It shows how imaginative kids are and really expect Jannah to be the same. A world full of imagination and beyond…We’ll be sending our #AlhamdulillahForSeries gratitude journal to her in shaa Allah. 5) Alhamdulillah for letting my dad get money from his work and telling him that I wanted a cupcake with a yellow ring on it, and then my dad got it for me. Thank you, Allah for listening to my dua. The best thing about this caption from a 4 year old girl was the cute little story behind it. 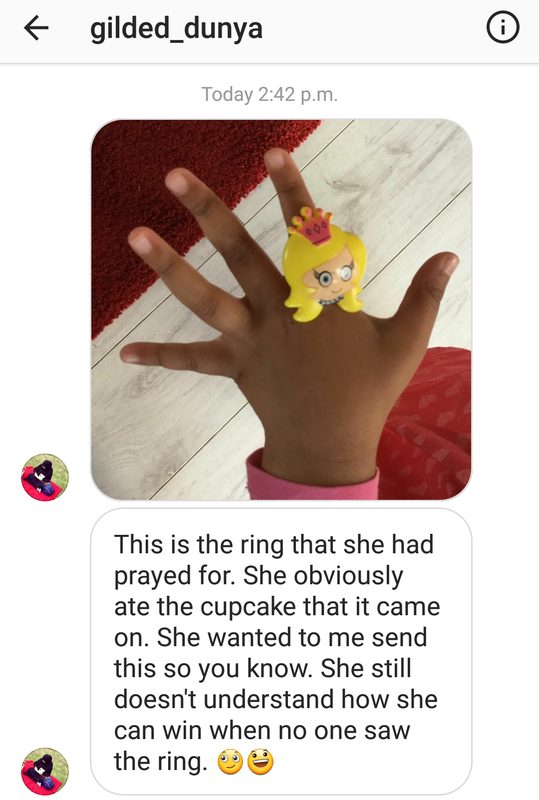 She didn’t just say “Thank you, Allah for listening to my dua” – she shared her dua and had such conviction that her father was only able to bring her that favourite cupcake because Allah told him so. Doesn’t that make you want to be a child again?! We’ll be sending our #AlhamdulillahForSeries gratitude journal to her as well in shaa Allah. 6) Alhamdulillah for my little brother whose ice cream I can always take as he’s not able to finish it! This 8 years old boy had us all laughing! 😂 Salaty will be sending him a prayer chart along with the sticker sheet. 7) Alhamdulillah for Allah making all our dreams come true in Jannah! When kids talk about Jannah, it’s the cutest thing ever! My Deen magazine will be sending their Ramadan edition to this 6 year old girl in shaa Allah. Gratitude CAPTION Contest finally comes to a successful END! Alhamdulillah ❤ Few months to rest before we start the gratitude ART contest around the same theme – #AlhamdulillahForSeries (before Eid ul Adha in shaa Allah). Subscribe to stay updated! Looking forward to your participation 🙂 you can follow us on IG to be notified as soon as the contest starts in shaa Allah. Masha allah …contest sounds intresting…. Really love this! Good luck to everyone participating! Eeek, this is so exciting!! And what lovely prizes, too! Gonna enlist my kids to enter the youth contest also insha’allah 🙂 Jazakillah khair! Fantastic idea. Mashallah. have fun with the contest! I love this idea! The prizes are amazing and the idea is wonderful. So looking forward to the result for this one. I can only imagine how tough it would have been to finalise the entries. Alhamdulillah you could do it and yes I have voted my favorite one. Alhamdulillah. The entries will be accepted on social media – first round is Instagram exclusive while second one is for Facebook. A good concept. I am looking forward to know the results. May god bless all.